I recently re arranged my desk and tidied up my make up so I thought I would share a few pictures with you. I know a lot of you will have much more makeup than I do, and at the same time, a lot of you will have a lot less. I am a hoarder, I hate throwing things away and probably have a lot I should have gotten rid of, I am long overdue a clear out! I try to keep all similar things together so on the left, the first stack is lip products, the next stack is eye products. 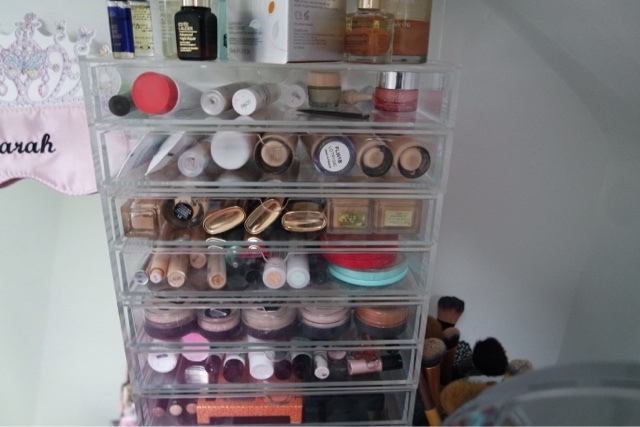 I then have my mirror and then the stack on the left of it is face products. I then have my makeup brushes and a small mirror on the end. I try to the sort our each section into subsections. For lips, I keep the glosses separate from the lipsticks. I also have all my lip pencils together. For my eyes I keep eyeliners separate from mascaras and try to keep all single eyeshadows together etc. For my face, all foundations are together, I think have separate sections for primers, blush, concealers etc. 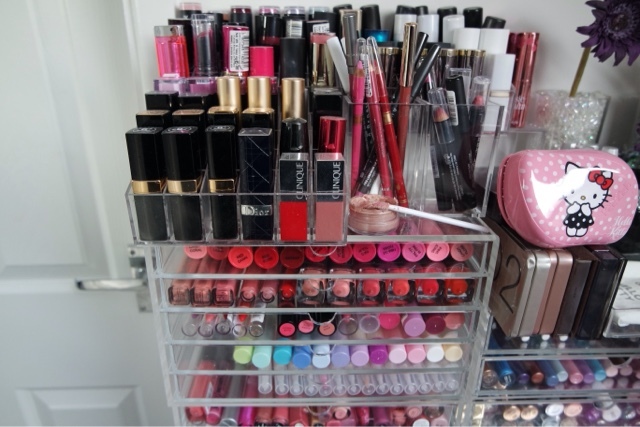 I would love to see your makeup collection/storage so please tweet me @sarahtrademark if you have any posts/pics!